Forty-eight year-old Emma can’t sleep. A deep, passionate, explosive thirty-year secret must be confessed. Or not. Eighteen year-old Emma can help. Or does she need help herself? Only one woman can decide. Two playwrights. Two actors. One character. Buckle My Shoe. Buckle My Shoe is co-written by award-winning veteran playwright Alexis Bernier (Theatre Ontario’s Playwrights Showcase Award) and newcomer Nastasia Pappas-Kemps (International Scholastic Arts and Writing Awards). The show stars Gina Clayton (Odyssey 5, I Was a Sixth Grade Alien, Patti and Degrassi: The Next Generation) and Lily Scriven (Billy Wigglesticks – Paprika Festival 2014) and is directed by Anna Pappas, Artistic Director of Ergo Arts Theatre (Antigone, If, Ithaca and The Odyssey Project). Ergo Arts began in the mid 90’s as skazmos theatre. Its work in Toronto’s independent theatre community has spanned two decades, and includes the development of new Canadian plays and musicals, original adaptations of ancient classics, a reading series of modern classics, Theatre for Young Audiences, and experimental bilingual works (in Greek and English) using the writings of popular and classic Greek writers. The company has worked with many of Canada’s finest theatre talent, including Martha Henry, RH Thompson, Diana Leblanc, David Fox, Barbara Gordon, Oliver Dennis, Janet-Laine Green, John Bourgeois, Maria Ricossa, John Gilbert, David Gardner and director Sue Miner, to name a few. Anna Pappas, Gina Clayton and Alexis Bernier have worked together many times. Their 2002 production of Breaking Character garnered the Patron’s Pick at the Toronto Fringe Festival. NOW Magazine’s Jon Kaplan called it, “One of the richest, most subtle scripts and performances at this year’s Fringe.” The three revive their decades-long collaboration with Buckle My Shoe – only this time, they’re adding two emerging artists to their group: Nastasia Pappas-Kemps and Lily Scriven. What unfolds is sure to be electric. This all-woman powerhouse team brings it to this year’s Fringe. Buckle up for Buckle My Shoe. 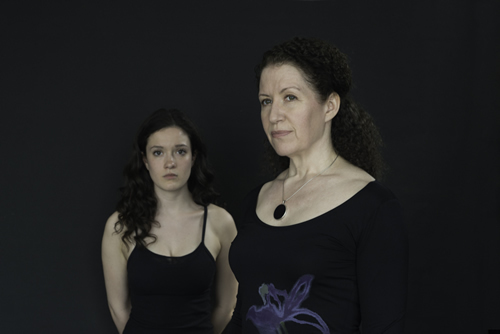 Photograph of (L -> R) Lily Scriven and Gina Clayton by Georgia Kirkos.